The two major party candidates vying to be Vermont's next attorney general squared off over sending prisoners out of state when they met in Montpelier Thursday for their first debate. 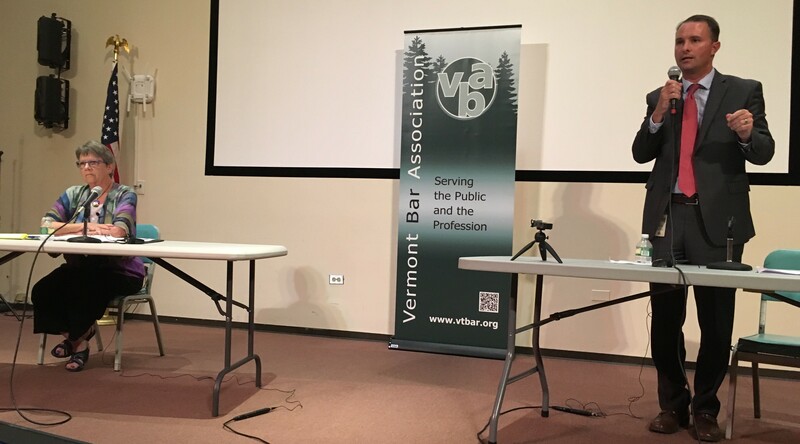 Chittenden County State's Attorney T.J. Donovan, a Democrat, and St. Johnsbury attorney Deborah Bucknam, a Republican, took part in an hour-long debate sponsored by the Vermont Bar Association in the Pavilion Building. They are vying to replace longtime Attorney General Bill Sorrell, who is not seeking reelection. In front of about 50 onlookers, many of them lawyers, the candidates often engaged in cordial exchanges and found little to disagree about. Their sharpest difference emerged when they were asked about Vermont's reliance on sending prisoners out of state. The Department of Corrections has more inmates than prison cells, and has for years contracted with private companies to house the overflow inmates elsewhere. Currently, approximately 200 Vermont inmates are being held in a Michigan prison run by the GEO Group. Donovan pledged to end the program by finding ways to release low-risk inmates and open up space in Vermont prisons. "It is a fundamental, basic duty to care for people in our custody, and yes, that includes prisoners," Donovan said. "It is not the duty of a for-profit corporation to take care of Vermonters. Their duty is to shareholders." Bucknam said she was concerned that it could be too expensive to end the out-of-state program. It is generally cheaper, on a per-inmate basis, to house them with out-of-state corporations than in Vermont. "It's very hard on families and children. However, we need to analyze the costs and benefits of the program," she said. "Where are we going to transfer those folks to? We need to show compassion for other folks in Vermont ... We need to also prioritize those law-abiding citizens." Both candidates said they oppose mandatory minimum sentences and sentencing guidelines, preferring to give prosecutors discretion. They also both called for the creation of an ethics commission to monitor legislators, and criticized Sorrell for not doing enough to combat opiate addiction and related crime.